For additional information about this book, visit the website www.conflict2creativity.com. A detailed user’s guide for organizational consultants, facilitators, and mediators. 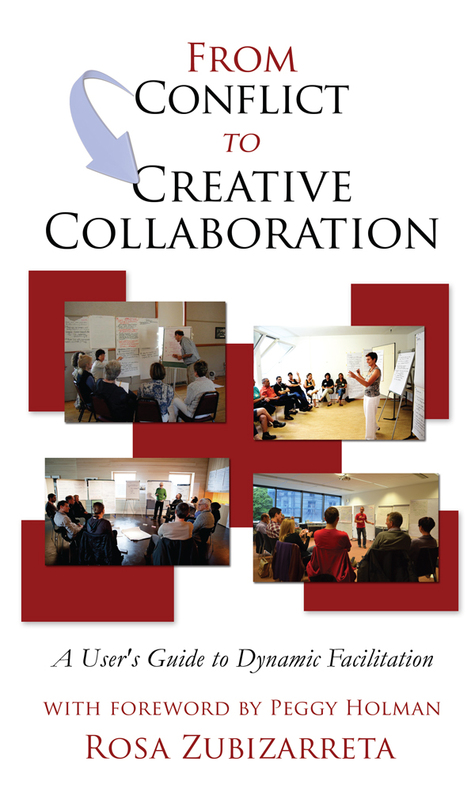 In From Conflict to Creative Collaboration: A User's Guide to Dynamic Facilitation, collaboration consultant Rosa Zubizarreta describes a ground-breaking facilitation method for transforming unproductive group friction into effective teamwork and innovation. Dynamic Facilitation's agile approach draws task groups into a co-creative “flow zone” – where participants create practical and innovative solutions while building trust, empathy, and authentic community. Some of the distinctive features of this approach include welcoming solutions initially and throughout the process, as a form of rapid prototyping, and using empathic listenint to create safety for both solutions (creative thinking) and concers (critical thinking). As we create a "map" of the different perspectives that are present, we support participants' own ability to recognize patterns and create new meaning. Rosa Zubizarreta helps leaders and groups work productively with conflicting perspectives, by learning how to transform the energy of divergence into greater co-creativity and innovation. With an academic and professional background in Organization Development, she has worked with a broad assortment of group modalities, including Action Research, Open Space, Future Search, and Dialogue Mapping. She is also trained in various “inner listening” modalities including Focusing, Inner Empathy, and Internal Family Systems therapy. Since 2000, Rosa has developed a deep content expertise in Dynamic Facilitation, a powerful process for transmuting impossible-to-solve problems into breakthrough insights, solutions and possibilities. In addition to leading workshops for consultants, facilitators, and mediators, Rosa enjoys consulting with business, non-profit, governmental and community organizations.